Last week in a cooking class, I ate my first bite of raw tomatillo. It tasted fresh, acidic, and nothing like what I’d expected. 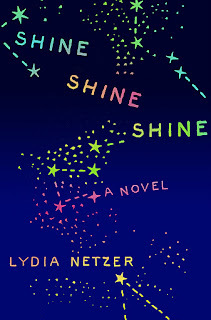 So it was when I read Lydia Netzer’s Shine, Shine, Shine, a novel so fresh and filled with quirky, endearing characters that I felt I’d been dropped behind the closed curtains of a mansion where nothing was as it seemed. Netzer’s debut invites comparisons to novels by Tom Perotta and Anne Tyler with its laugh-out-loud dialogue and subtle glimpses of people we see every day yet never really know. Sunny is pregnant and married to Nobel Prize-winning robotics scientist/astronaut Maxon Mann. They have a four-year-old autistic son, Bubber, and Sunny’s mother is dying as Maxon is floating in space when “Shine Shine Shine” opens with these words. “This is a story of an astronaut who was lost in space and the wife he left behind. Or is this the story of a brave man who survived the wreck of the first rocket sent into space with the intent to colonize the moon. This is the story of the human race, who pushed one crazy little splinter of metal and a few pulsing cells up into the vast dark reaches of the universe, in the hope that the splinter would hit something and stick, and that the little pulsing cells could somehow survive.” Actually Netzer’s delightful debut is all of the above and much more. It’s a tale of love, regret, acceptance, forgiveness and it’s a novel that will make readers think about what it means to be normal and real. Sunny isn’t the typical neighborhood wife as is literally revealed when an auto accident causes her to lose the wig she always wears. Sunny has alopecia; she has no hair – no eyelashes, no brows. To appear normal, Sunny carefully applies false eyelashes and wears wigs so no one in their upper class neighborhood knows until the accident that she’s not what she seems. With her mother dying, her husband stuck in space in a disabled rocket and her son’s preschool suggesting that Bubber needs additional help, Sunny decides to “come clean,” to appear as she was born and perhaps to make changes in her life that will allow nature to take its course. The novel explores Sunny and Maxon’s childhood beginnings and the part Sunny’s mother Emma played in teaching Maxon to act normal. Emma gave Maxon scripts that he translated into equations and proofs to determine how to behave. As an adult, Maxon’s success has come through building robots that emulate human behavior. And with Maxon’s success came Sunny’s desire to make them seem more normal and her shunning of anything that might make their lives more difficult. “But I thought she was on life support,” said her friend Jenny. “Yes, and it’s working” she told them. Sunny also worries about the new baby and Bubber, with the medicine he was able to pass for a regular kid, sometimes. The baby inside her stretched and turned, uncertain whether it would be autistic or not. Whether it would be more like Maxon or more like Sunny. Whether it would fit into the neighborhood. “I do love him,” . . . I love him so much that I want something better for him, something better than what we had. Everything about us is so complicated. I just want to save him from that. Let it be simple. Let it be obvious. Shine, Shine, Shine is a novel for our times. We’re all odd balls – bald in some way. We cover up and try to seem normal. Yet, we too may find that when we reveal our “baldness” that we’ll become more human, more real. Summing it Up: Shine, shine, shine is exactly what this novel does. Had Vonnegut written The Velveteen Rabbit, it might have resembled this take on astronauts, autism, alopecia, and what it means to be real.